Everywhere you look, someone has a mobile device in their hand. In a restaurant, at a store, walking down the street, while brushing their teeth, or even having a crown placed… people are perusing the internet on the phone. A study by Pew Research Institute indicates that 28% of Internet usage comes from a mobile phone. Knowing that, having the RIGHT mobile option for your website is imperative. So, I broke it down into the three primary solutions we see and where they stand. This was the trend for mobile sites. A mobile site is an abbreviated version of your site. It is where YOU – the practice owner – decide which pieces of information are shown to the people visiting your website. Then at the bottom, the person can still click to go to your full website for any information not found. Sounds convenient. However, the challenge is that YOU are determining what you THINK the viewer wants to see. If you are wrong, you are gambling that the viewer wishes to take more time to navigate to ANOTHER site. There is much information to suggest that this creates a barrier for the viewer. In marketing, the fewer clicks and the easier to find the information – the better. Opinion: Outdated. Navigate away from this option. A mobile friendly site is one that can be easily seen on a mobile device whether it be an iPhone, iPad, Android, etc. It will resize the dimensions of the existing site so that distortion doesn’t occur. The graphics can be viewed and not blacked out. The viewer can access the information. Many sites are done like this and is preferred to the mobile site because all of the information is in one place. In addition, the practice branding stays intact. For a site to be mobile friendly, all functionality on the site must work on the mobile devices as well. The challenge with this format is that the viewer has to zoom in to read and see anything in detail. Opinion: Acceptable but on its way out. You can hold steady while you make plans for a better option. A mobile responsive site is one that takes the same information on your site, but it reformats it so that it can be easily read and seen on a mobile device. It is designed to fit and function the mobile device it is viewed on. This is the latest, newest format. The benefit is that you get the best of both worlds. Easy to navigate. Easy to read. Branding intact. Nothing is sacrificed for the sake of viewing. Remember, everything on your website is important or it wouldn’t be there. A responsive site is a great way for viewers to get all the information. Opinion: This is the BEST option and will provide the best results. Navigate towards this solution. Choose the best solution for your practice. It won’t make or break your practice right now, but internet searches from mobile devices is on its way to being the majority of searches. 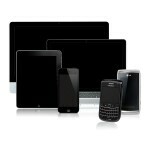 More and more companies are even moving from desktop and laptops to more of a tablet style solution. Be ahead of the curve and reap the rewards!